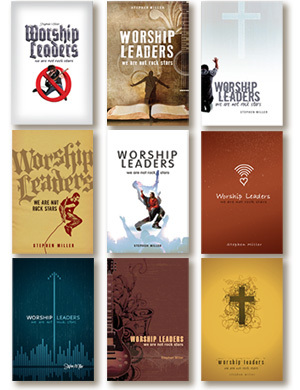 Design Corps was involved in every facet of the design of Worship Leaders, We Are Not Rock Stars. designing the cover, the interior, and finally developing the page composition for the book. As usual, we started by asking questions about the content, the audience, and similar titles to Worship Leaders, We Are Not Rock Stars. But we also paid particular attention to what were the author’s impressions about what the cover should be. This led to looks ranging from tongue-in-cheek rock posters, to folksy indie cover art; from heavy metal grunge to business-minded symbolism. Two very different concepts were developed. Both of these developed covers included in them a lot of fine detail that gave each cover a rich feel in their own way. The first spoke to the artist. It had a folksy artistry on it that is popular with many indie bands. This art referred to what was to be the core of the worship leader: Christ and God’s Word in their heart. The folk art was built with seven different illustrations including a scroll, a heart, a music score, a sound board graph, a cross, and a scripture reference. In the end this concept was abandoned for one that spoke to a broader range. The second cover showed a sound board with central column pointing upward, implying that, no matter what the media, the message should point to Christ. The final cover added detail by using an illustration of a sound board mixer, to which we added a neon glow and a background close-up of an old monitor’s pixelation. 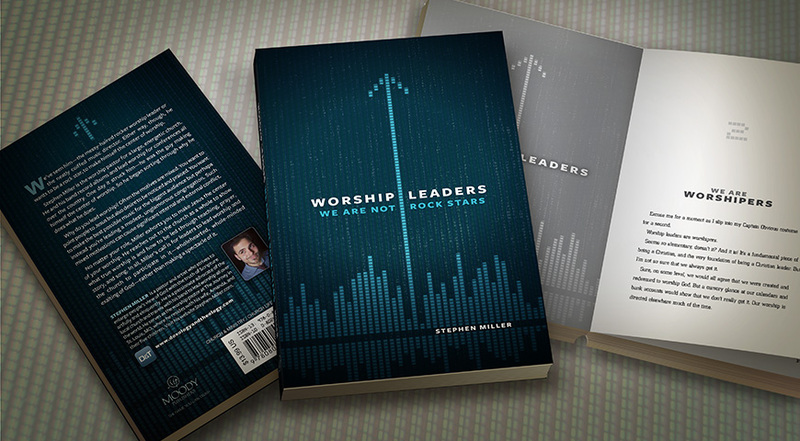 1- Amazon book description of Worship Leaders, We Are Not Rock Stars by Stephen Miller, http://www.amazon.com/Worship-Leaders-Are-Rock-Stars/dp/0802409865/ref=sr_1_1?s=books&ie=UTF8&qid=1364319346&sr=1-1&keywords=worship+leaders%2C+stephen+miller , found March 26, 2013. Design Corps is about visual communication. We help you to speak to your audience. And we can also help you to: determine marketing criteria, identify project steps, and manage production. Whatever your design needs, we give you design solutions that will meet your objectives, your schedule and your budget. © 2014 Design Corps. All Rights Reserved. LOGIN.